When it comes to family accommodation, no other hotel can beat Holiday Inn; the World’s most family friendly hotel chain. Holiday Inn Melbourne on Flinders provides the best family accommodation in Melbourne. Thanks to a range of facilities and services, as well as a unique family friendly environment. We have a reputation among families for being the best family hotels in Melbourne. Our Melbourne CBD hotel welcomes your family with open arms.You will be greeted with a smile and a wave upon entering our hotel. We happily engage with all hotel guests big and small to create a holiday environment comfortable for kids. Best of all, we have the guest room flexibility families need for comfort and the location travelers need for convenience. We are right near Southern Cross Train Station and are in the Free Tram Zone. Save up to 35% on stays in our family friendly rooms in the Melbourne CBD. Valid for stays until 30 June 2019. Plus Kids 12 years and under Stay and Eat Free! Sale ends 26 April 2019. Travelling with the family demands an organised and stress-free accommodation experience. At Holiday Inn Melbourne on Flinders, relaxation begins at arrival with a safe off-street driveway, onsite carpark and efficient check-in process. All children upon arrival will receive a Holiday Inn exclusive Little Big Travellers Melbourne kit which includes a Little Big Travellers coloring in book, Little Big Travellers guide to Melbourne, crayons and other little surprises. Family friendly facilities and services make family holidays in Melbourne a pleasure. Comfort extends to our modern, spacious and secure guest rooms. For larger families or groups, we offer flexible configurations and interconnecting rooms, plus free rollaway beds and portacots. All of our rooms have kettles, tea and coffee amenities, empty mini-bar fridges (so that you can put your very own goodies in them! ), bluetooth alarm clocks, electric black-out blinds (perfect for the family sleep in), SOAK Amenities, HD TV’s with Disney Channel and ABC Kids and USB outlets to charge all of the families electronic devices. The rooms have recently been refurbished with the modern family travellers in mind. They have everything that you need to make your stay a great one. At Holiday Inn Melbourne on Flinders kids receive special treatment with our Kids Stay & Eat Free program. Kids menus have been designed to satisfy kids’ appetite for flavour and fun, and parents’ desire for healthy, nutritious food. Enjoy breakfast, lunch and dinner at Sirocco Restaurant. Our renowned hotel restaurant features an affordable menu that’s both adult and kid-friendly. Sirocco is even open early evening for dinner service to suit the routine of kids of all ages. It’s not just our location in the Melbourne CBD that makes us a popular hotel, its our facilities that also make us a firm family favourite. Guests enjoy our heated outdoor pool, Sirocco Restaurant and Bar, cardio gym, coin laundry, 24 hour reception and 24 hour room service menus. Our guests are spoilt with comfort and convenience. 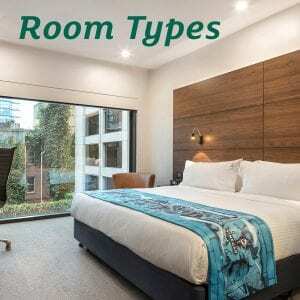 Melbourne’s ultimate family friendly hotel, Holiday Inn Melbourne on Flinders, has a range of accommodation deals and packages perfect for families. Browse our range of hotel deals and save on your accommodation so you have more to spend on the fun, family adventures our great city offers. Our Best Price Guarantee means you’ll get the best rate by booking direct. Plus remember, Kids Stay & Eat Free with any family accommodation booking. * Clicking the ‘BOOK NOW’ button above will direct you to the Holiday Inn Melbourne on Flinders booking engine. Your special offer will be populated once you have entered your dates of stay. Would you let your kids call the shots on your holiday to Melbourne? The Wunderlust Storytellers family did! Family holidays are all about having fun and Melbourne is filled with exciting adventures for the whole family. With the city’s best attractions within easy walking reach, our hotel is an easy choice for your family accommodation in Melbourne. Walk to Melbourne Sealife Aquarium or Pollywoodside, or take a wander along the Yarra River. Visit the zoo, attend a sports event, show or concert, or simply enjoy the sights and sounds of the city. Our Melbourne family hotel let’s you enjoy the benefits of being close to the action, inside Melbourne’s free tram zone, plus Southern Cross Station is a short 300m walk away. After exploring the city, the whole family can relax and enjoy a range of family friendly facilities at the hotel. The kids will love our heated outdoor pool while parents relax on one of our poolside sun lounges or in the adjoining terrace area. And during school holidays, the kids will love the playroom. We understand that parents need time out too. Utilise our hotel babysitting service to escape and enjoy the more adult experiences our incredible city offers. Our convenient location enables you to access CBD restaurants, cafes and shops, Crown Casino and the vibrant Southbank and South Wharf entertainment precincts.